Certified SHORT PRINT autograph card from the 2001-02 Be a Player series. Please add for shipping $2.95 (Canada), $4.95 (U.S.), $6.95 (International). Save on shipping costs as multiple purchases will be combined..
Mike Vernon. Cards are sent in a plastic card protector. 1987-1988 O-PEE-CHEE HOCKEY BGS 9.5 SET BREAK. 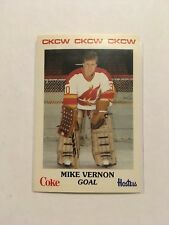 You are purchasing a:Mike Vernon Pacific Dynagon Silver card from the 1997-98 season. Mike played for the Detroit Red Wings. The card is numbered # 45 in the set. Condition:The card is in near-mint to mint condition. You will receive the item(s) pictured. It is card # 3WC-19 in the set and is nr-mint condition or better. Player: Mike Vernon. Item#: 215. Attributes: Rookie. Year: 1987. This is the highest grade card from that rare factory master set and the population is 1. All of which were also limited to 450 printed.